The Santa Claus parade means different things to different folks. For me it’s the harbinger of a long bleak winter and I am most definitely not dreaming of a white Christmas. This born-and-bred Canadian would be quite happy if she never saw another snowflake. OK, maybe I’m overreacting, but after a month or so of winter’s gloom, slush and salt-stained boots, I crave sunshine and some R&R. 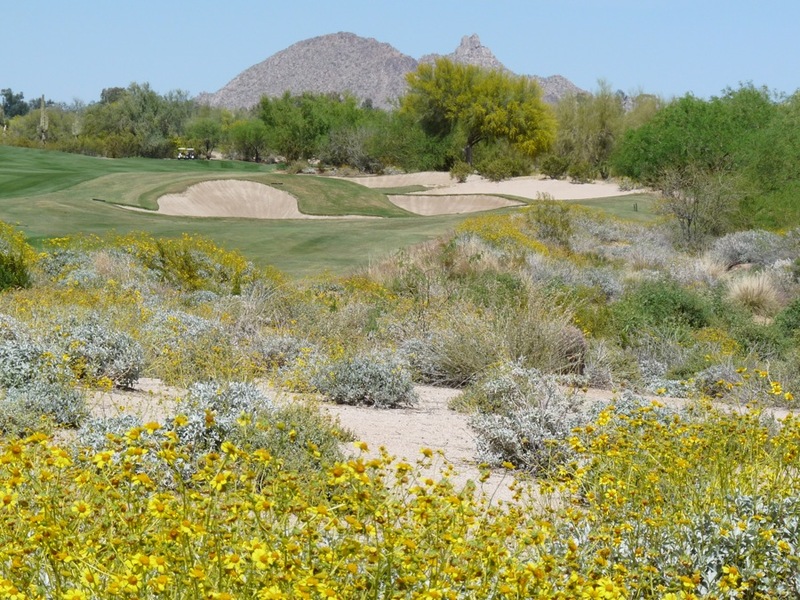 For me, that R&R translates into golf and the Valley of the Sun in central Arizona, with more than 330 days of sunshine per year, delivers just what the doctor ordered. “Surprise, innovate and knock the guests’ socks off” could well be the motto of the following resorts and golf courses. Obviously I’m not alone in my praise. Just as I was about to push the “send” button for this column I received an announcement that Scottsdale has been has been voted as “2010’s Top North American Golf Destination” by the International Association of Golf Tour Operators (IAGTO) at a ceremony at the City of Arts and Science complex in Valencia, Spain. Imagine is the name of the sculpture rising from a pond at the ninth green on the Acacia Course at the Westin Kierland Resort & Spa in Scottsdale. This artwork, dedicated to Katherine Herberger whose family built the resort, captures the innovative spirit here. Kierland was the first to outfit golf carts with air conditioners that blow cool air around your neck. It’s the only resort in Scottsdale where golfers can opt to ride the three desert nines (Acacia, Ironwood and Mesquite) on Segways (scooters) customized to hold your bag. It’s also the only resort where the cart gal will sell you a wee nip of premium Johnnie Walker Gold, Green and Blue label whisky. If you really want to get into the Celtic swing of things, play your round in a rented kilt, laddie. In keeping with the Scottish theme, a piper clad in full Highland regalia squeezes the bagpipe every evening at sunset. Serious about improving your game? Trainer Steve Heller has developed the FORE-MAX Golf Training System (I call it boot camp), a customized program of strengthening, stretching and cardio conditioning that he teaches at the resort’s fitness center. Heller has also worked with the Agave Spa’s therapists to formulate a FORE-MAX Golf Massage to get the kinks out. Kierland’s innovative philosophy extends to the kitchen. At the Latin-inspired Deseo restaurant chef Douglas Rodriguez creates dazzling ceviches. My favourite combines shrimp, crab, radish, jicama, green apple and a plantain chip fused together with lemon and lime juices. Wash it down with your own customized mojito at the Muddle Bar. 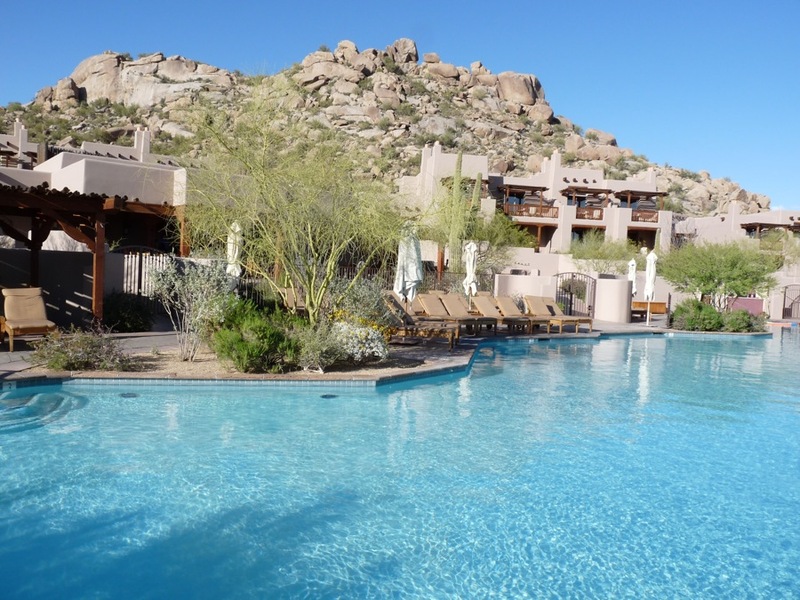 Competition among the Scottsdale’s luxury resorts is alive and well. Not to be outdone, the Four Seasons Resort Scottsdale at Troon North has a few tricks of its own tucked up its snazzy sleeve. The newly renovated pool complex now has two VIP cabanas available for a daily rental fee. They are outfitted with flat screen televisions, mini fridges, I-pod docking stations and ceiling fans. Free poolside amenities include chilled fruit kebabs and smoothies and refreshing mint-scented towels. 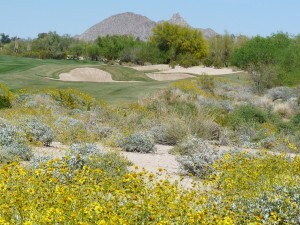 Should you wish to pry yourself away from such pampering, the Four Seasons has an exclusive arrangement with nearby Troon North’s two championship courses, the Monument and the Pinnacle (consistently rated in Arizona’s top five), that gives guests preferred tee times and free shuttle service. Golf Magazine calls Troon North “the crown jewel of desert design, a 36-hole complex by which all other such facilities are judged. Take a swing at legendary designer Tom Weiskopf’s two new layouts and see for yourself what folks are raving about. 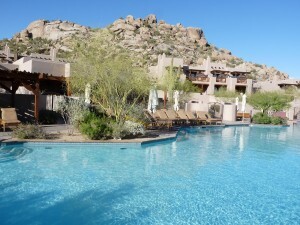 Among its many attributes, the Fairmont Scottsdale Resort is located beside the famous TPC Stadium Course, home to the Phoenix Open, also known as the Greatest Show on Grass. 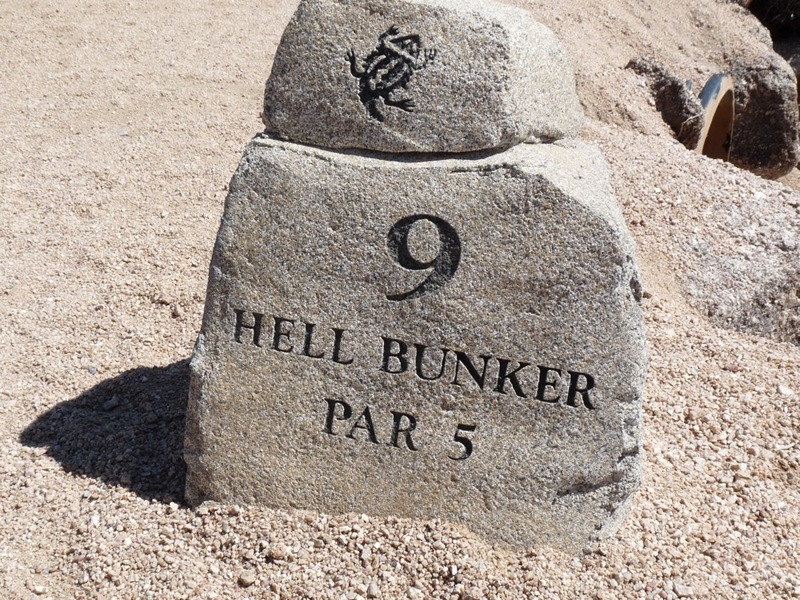 Last winter I attended the fabled Waste Management (formerly FBR) Phoenix Open. I assure you that it’s not like any other major golf tournament on the planet. Imagine frat house revelry at a football game. On the par -three 16th hole, the bleachers are packed with fans who cheer or boo the golfers depending on whether or not they nail the green. Carrying an alcoholic drink seems to be mandatory. After the game, a huge tent called the Bird’s Nest becomes party central. As one local observed, “it’s the greatest concentration of cosmetic surgery on earth. I was wondering if perhaps there was a two-for-one (pardon the pun) on breast implants. There’s nothing staid about this event and that’s just fine in my books; anything that gives golf a friskier, sexier image is good for the game. (Tiger excepted). Dates for 2011 are January 31 to February 6. For ticket and information visit www.wastemanagementphoenixopen.com.